The 2014 Research Excellence Framework (REF) assessed the impact of research undertaken by UK universities for the first time. Universities submitted case studies to demonstrate their research impacts on “the economy, society, culture, public policy or services, health, the environment or quality of life, beyond academia”. The Committee of Heads of Environmental Sciences (CHES) is the arm of the Institution of Environmental Sciences (IES) dealing with higher education, and thus has a keen interest in how the discipline informs society as a whole. 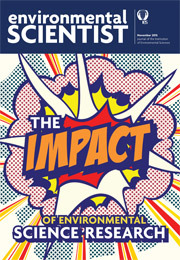 Here, we showcase the impact of environmental science research from UK universities, and explore how researchers develop and demonstrate impact, ensuring that interdisciplinary work is appropriately represented in analyses of societal effects.